Sad to report the passing of Jack Patten on Saturday January 19th in Nanaimo, British Columbia, Canada. He was well known around Newhaven having moved there from Southampton after the war. He worked around town and for a time; with his wife Jacqueline; ran the little shop in Newfield Road before emigrating to Canada with his family. He was a local Air Cadet and became involved as an instructor later on. He also contributed comments and articles to Our Newhaven. 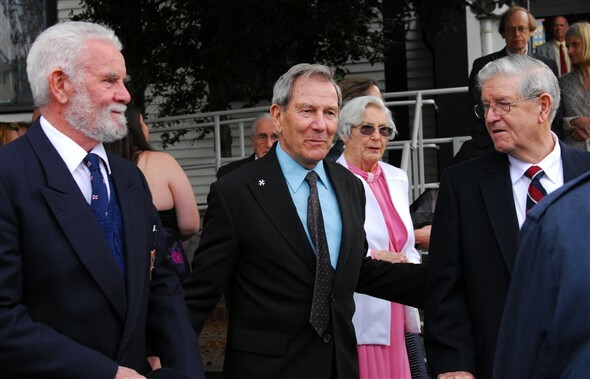 He is pictured in March 2010 with brother Len (left) and Laurie (right). This page was added by Rob Patten on 31/01/2013. So sorry to hear of Jack's death. He was our neighbour in Wellington Road Denton. My brothers and parents used to spend a lot of time talking to him and his wife through the hedge. I am glad I was able to make contact with him through this site last year. I would like to send my condolences to his family. I would also like to add my condolences to you & Jacqueline at this sad time. We were Jack & Jackies neighbours on the other side when they lived in Wellington Road ! Thanks John and Terry, as Uncles go he was a pretty good one. His son Lee and I were always thrown together growing up in Newhaven as we were only a couple of months apart. The memorial service is on Sunday, I'll make sure the family are aware of your comments. Rest in Peace Jack. Condolences to Jackie and all the family. Another good man who's no longer with us. What a great guy Jack was, I well remember his great sign writing skill and the many jobs he did for our family business in Newhaven, including sign writing our shops and delivery vans. Where do you fit into the Bannister family Trevor, I worked for Bannisters Builders from 61 to 71 the Govenor was Clayton Lee his brother Bob was company accountant. His son Christopher worked with us for while, learning the ropes, he had to put up with a lot of mickey taking. He went farming later. Bob Bannister was Clayton's cousin rather than brother. Amongst many other things, he had been a baker at 8 High Street, a business taken over in the late 50s by Ben Funnell. Clayton's brother was Alan Bannister who for many years was a greengrocer in the High Street. Bob's brother was Harold Bannister, an interior furnisher, first in Bridge Street and then with his son Trevor in the High Street. (Incidentally, Bob was my father). So sorry to hear about Jack, I knew him very well, I worked with him and saw him when he came over to see his brothers. Real nice guy. Sorry to see about the passing of Jack Patten. I was in the ATC same time, Laurie was the flight sergeant, still have my ATC log book with Lauries signature signing my returning of kit on leaving to start my national service in the RAF IN JULY 1952. Laurie went in after me and I think was a drill instructor. I was an airframe mechanic in the RAF and followed this career into De-Havillands Hatfield. Have lived just outside Cambridge since 1969 with a lot of the RAF around bases where we went to camp whilst in the ATC. Oakington, Upwell, Upwood. Must say in the top photo they did not change much. Was in the same class (Sid Ray) as Brian Patten who I did meet a couple of times on visiting Newhaven. Brian Patten still lives in Newhaven with Yvette but is effected by ill health. My father Len has also moved back to the area (Seaford) with his wife Fran, but sadly is also suffering with poor health. Laurie continues to live in Canada with Helene (Lynn). Sorry to see your comments Rob of the not so good health of your father and Brian. Is Laurie's wife the young lady I remember who lived along Meeching Road? I have just read this page and was sorry to read the news of Jack`s passing. Albeit a little older than me Jack was a school mate of mine and his wife Jacqueline also a close school friend who was in my last class at school together under Mrs Marchants tuition. My late mother and father (Jack and Ella Bulman)were life long friends of Jacks brother Laurie who worked alongside my father for Bennetts builders before his emigrating to Canada. My sincere best wishes to all the Patten family. Francis, Norma and the Bulman family. So nice to see the letter from you Francis and thank you for your good wishes. Actually, Jack also worked with your Dad. We used to visit your Mum & Dad almost every time we went back to England. Always good to see them. Somewhere in Our Newhaven is a picture of our class with Mrs Marchant of which I replied to giving some of the names that I remembered, one being yours! Such a surprise at the time to see it, nice though to be taken back in time.